I recently brought my desk from the study upstairs to the bedroom. This is one of the upstairs rooms in the midst of renovation. Right now there is a plywood floor, and paint that has been on the walls and windows since 2004. Yup, you read that right! But I thought this was the place where I'd love to sit down and do desk work. I still pay as many bills as I can with a check, and I still check my account on paper. I write my Christmas cards and letters here. Just out the left window is where the new garden is going, and it will be a treat to look out and see it, and out the right window I'll be able to see the daffodils we planted in the fall. I wanted to get a wall calendar for the room, and decided on the Susan Branch one. Feed your soul with silence - that's where dreams are born. Sounds of Silence Crackling fire, furnace humming, oatmeal bubbling, snow falling, cats purring, dogs snoring, page turning, flickering candlelight, clicking knitting needles, pen scratches on diary pages, stars twinkling, & moon shining. Linger in bed those first dreamy moments after waking & listen to the birds. Rejuvenate yourself in nature - a walk-a-day keeps the doctor away. Cultivate optimism - count your blessings & remember, for better or for worse, nothing lasts forever. Meaning what, do you think? That we need the quiet of winter for the deep thoughts that give us a sort of wisdom in the coming spring?? A bit like planning one's garden? 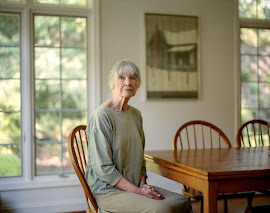 I have loved Susan Branch's work for a long, long time. Do you know her? If you go here, you may find out about all her work and her life. Thanks for giving us a look at your desk and the lovely view you have from the windows, Nan! Now I can think of you sitting there writing and gazing...love the things the calendar gives you for January. Enjoy! I always love peeking inside your home! You've picked a great spot to sit and write. Mine is similar, although most of what I see out my window is trees, trees, and more trees! :) I no longer have my big, beautiful antique desk (one of my only regrets about selling off most of our furniture before moving here) and I hope to someday replace this folding table with something more pleasing to the eye. I used to get SB's newsletters (and her calendars) and have re-suscribed since I do love all the quotes she shares. Thank you for reminding me about her. Have you read her books? I own three of them but haven't read one yet! They are so beautiful. No, I haven't. I remember looking at them longingly when I shelved them at B&N, though. You'll have to let me know how they are, after you've read one or two. 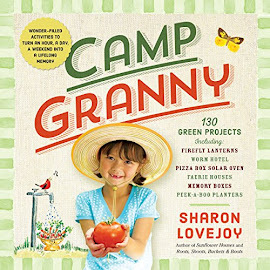 I expect they will be just as wonderful as her cookbooks and calendars! One is about going to England on a ship! All such exciting plans, gardens do grow one's soul. It will be nice to sit there and look out. Lovely to sit at a nice desk writing and planning. I love what you wrote! Thanks. Nice peaceful woodsy scene. Looks like a nice spot for such a desk. Thanks. It is actually one of those bar seats. Can't remember what they are called, but it can make into a bench with a high back. That is such a lovely spot to look out on when you're at your desk, Nan! And it holds books underneath? Perfect! 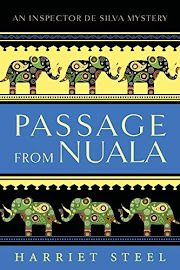 A blog friend introduced Susan Branch to me last year and I am so entranced with her blog posts. I pull them off on my desktop and take my time savoring a little more every day until finished and then read them again. 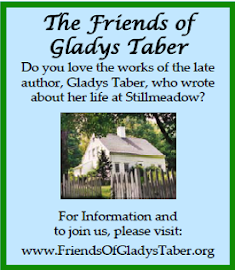 And of course to find out that she loves Gladys Taber too completely won me over. I had reordered my regular calendar that I love before thinking about ordering Susan's but think I must get one next year. I still have the treat of her books ahead of me. I don't want to get them from the library, I selfishly want ones of my own. 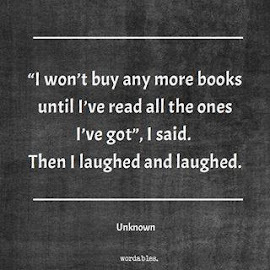 How have you resisted reading one? I haven't ... yet. Story of my life, really. I think that Susan's birthday is the same as Gladys'. She has done a lot to promote GT over the years. I love the placement of your writing desk. A more perfect place could not be found. It is so nice and neat. Have fun messing it up. ;) I have never heard of Susan Branch. I do like the quotes and the look of the calendar. I will have to look her up to see what all she has written. Maybe I can find a book of hers at the library. Thanks for the tip. Actually it is always quite like this. I love the order of it. Oh, I think you will really enjoy her. The first time I "met" her was through her lovely cookbooks. 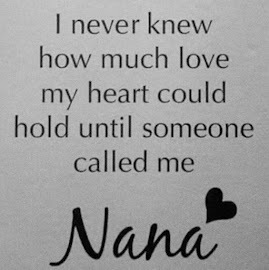 Hi Nan. I must have heard about her from you once before. I went to the library to get her book 'A fine Romance: Falling in Love with The English Countryside." I thought that sounded familiar and sure enough when I looked at it I realized I read it last year. Ha... Yes, I did enjoy it too. Unfortunately they didn't have another of her books. Very funny that you had read it!! Does your library use Inter Library Loan? Perhaps you could get more that way. I love Susan Branch! I have her calendar on my bulletin board; I have a bunch of her books (her trio, The Fairy Tale Girl, Martha's Vineyard and A Fine Romance are my faves); and I follow her blog and on Instagram. We were meant to be blog friends, weren't we?! I do remember Susan Branch from some time in my past but cannot remember what or when. Lovely view from the desk. She is quite, quite wonderful. And thank you. 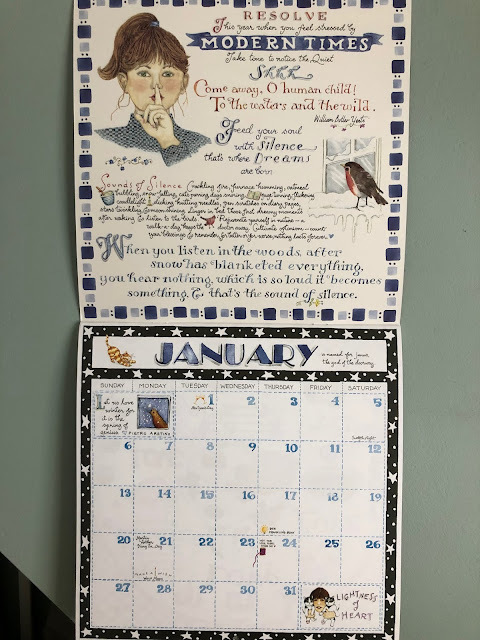 I am not familiar with Susan Branch and/or her work, but I like the look and "feel" of the calendar. A desk with window views is wonderful! At one of the offices where I regularly work, the room is so long and narrow that they have placed two desks in a row along the wall, so all you see is either your computer screen or the blank, white wall. Which is OK for work, as of course they want you to have as little distraction as possible, but it does not make for a very nice office. When I get up from my chair and walk to the window, I can see all across my town - the office is on the 9th floor of one of the highest buildings in town. Silence - or, quiet - is so welcome to me! Living in town means I am almost always surrounded by noise, and the older I get, the less I can stand it. I think you might like her work. She is a wonderful artist, and really is all about living a good life. I liked hearing about your office. I agree with the lack of distraction. Do you know that picture of EB White in his writing space? The ocean is outside the window. I don't think I could ever look away. I remember a while back there was a problem in your apartment. I should recall more details, but I think noise was a problem. Still going on?? 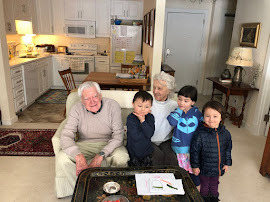 Noise is always a problem in this house for me, and yes, it is still going on - and always will be, as long as there are other people living in the same house! It is divided into 4 flats (apartments), one on each floor, including the basement and the attic. Plus it is a semi-detached house, so I also hear my next door neighours. Both houses were built in the early 1950s with not the best materials and not for wealthy owners, so little effort went into the insulation of walls and floors/ceilings. I don't know who EB White is, but I shall look him up. I'm so sorry to hear this. I just finished watching Foyle's War, and they were talking about that very thing - only in England. All these new, inexpensive houses that were built after the war. 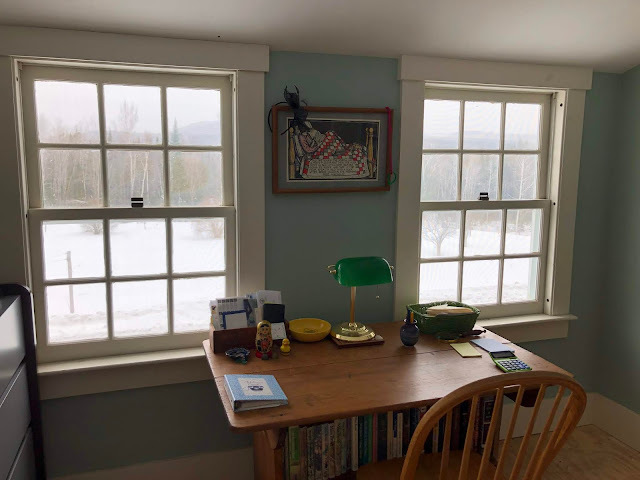 I think moving your desk upstairs to the window was a great decision...I am a big Susan Branch fan and have been reading her beautiful blog for years. In fact, one year I won a free copy of her book A Fine Romance! I think I have all her books, or at least, most of them. But this year I am using the Mary Englebreit calendar which is all about reading. And I have a second calendar about maps which was a gift from my dd Alice. So, though you have tempted me with your lovely picture of your Susan Branch calendar, I will resist. Thanks! I have more than one calendar, too. And one was a gift from my daughter! https://www.calendars.com/Great-British-Baking-Show-2019-Wall-Calendar/prod201900009615/ (in case you want to be tempted some more haha) Yes, Mary Englebreit. She was everywhere years ago, and now isn't as familiar to younger people. I have a blog post that has been in my head for a long time about this subject. I wonder if I'll ever get it written. 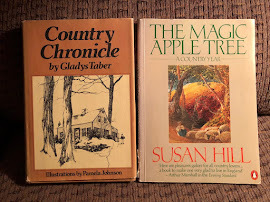 I've read all of Susan Branch's biographical books, which are so unique. I bought them for my sister but read them all myself, too. I might have to look into getting a calendar. I have a blank space in the house where a calendar hangs! I read her blog when I get a chance. They are multisensory experiences. Yes, they are. So much beauty on all levels. She's quite a girl!